The prestigious Indian automotive magazine Auto Tech Review, published by Springer India – the Indian subsidiary of Springer, a global publishing company - assigned the “Transmission Technology of Year” award to the Magneti Marelli’s Automated Manual Transmission (AMT) technology. This award is on top of three other important awards that Magneti Marelli received for the AMT in the past year: “Technology of the Year 2015” from Overdrive and the CNBC-TV18, “Technology of the Year” by Zeegnition and “Automotive Pioneer of the Year” from Motoring World Magazine. The continued success of Magneti Marelli Automated Manual Transmission (AMT) technology at awards is a direct reflection of its market success in India ever since its introduction in this country. The AMT represents, both from the consumer's point of view and from the perspective of the carmaker, an example of a technological value-added solution but at affordable cost which, by automating a manual gearbox with an electro-hydraulic “add-on” device, combines comfort in driving, consumption and emissions optimisation, and containment of industrial costs. “This important award assigned to Magneti Marelli’s Automated Manual Transmission – said Pietro Gorlier, CEO of Magneti Marelli - further demonstrates that the Indian market has fully understood the added value of the AMT made of innovation and technology at affordable cost and blending driving comfort with reduced fuel consumption and emissions. We are looking forward to further growth in India by bringing in the best of automotive technologies to the Indian market and its OEM players”. 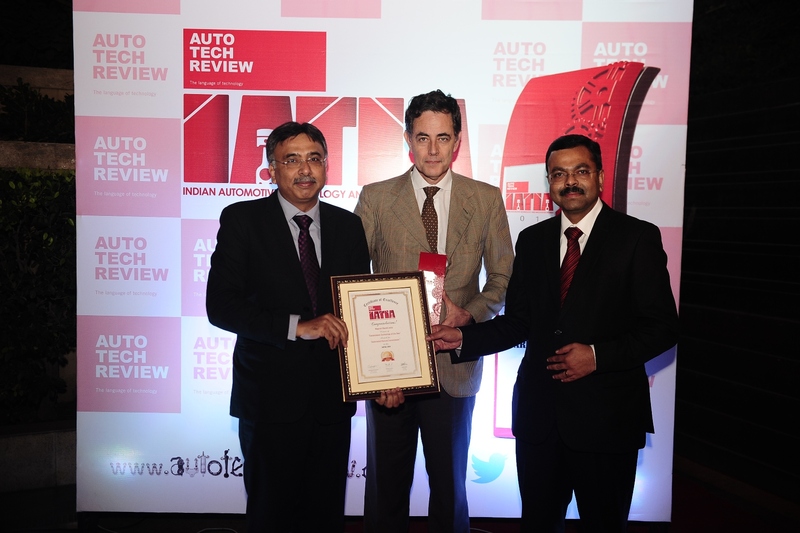 Saju Mookken, Country Manager of Magneti Marelli in India, stated: “We would like to thank the team of Auto Tech Review for acknowledging the excellence of Magneti Marelli AMT technology. The success of the AMT in these years has led us to inaugurate a new industrial site in Manesar, near Gurgaon that will address the demand from local carmakers regarding additional future implementations”. Auto Tech Review, India’s first and only automotive magazine that speaks ‘the language of technology’, instituted the first industry award to honour excellence in automotive technology and recognise the spirit of innovation among automotive manufacturers in India – the Indian Automotive Technology & Innovation Awards (IATIA) in 2014. Magneti Marelli has won the accolade in the second edition of Indian Automotive Technology and Innovation Awards held in New Delhi, India. The “Indian Automotive Technology & Innovation Awards (IATIA)” is assigned by a mixed panel of officials from Indian Government, Industry and Regulatory bodies along with journalists from the magazine and a number of influential opinion leaders. In this sense, for the jury of the “Indian Automotive Technology & Innovation Awards”, the Magneti Marelli AMT was a clear winner being one of the relevant technological responses to the needs derived from the “big shift” taking place in the Indian automotive market. Despite the mixed trends in the automotive global market, India continues to be one of the fastest growing markets worldwide, offering both carmakers and suppliers the opportunity to propose new technological solutions and innovations. The examples of successful car models currently equipped with the Magneti Marelli AMT gearbox in India include Maruti Celerio, Maruti Alto, Tata Nano and Tata Zest. The success of the technology has led to set up a new industrial site aimed at the production of AMT (Automated Manual Transmission) in Manesar, near Gurgaon. The AMT is an effective solution for transmission, combining comfort, reduced consumption and emissions, applicability to any manual transmission and lower production costs compared to traditional automatic transmissions. The technology is based on an electronic control unit combined with an electro-hydraulic system that controls the use of the clutch in gear changes, allowing the driver to change the ratio without using the clutch in sequential or in completely automatic mode. The electronic optimisation of the transmission offered by the AMT also means lower consumption and CO2 emissions compared to vehicles equipped with standard automatic transmission and manual transmission. The evolution of AMT will result in the 48 Volts PERF.E.T (Performing and Efficient Transmission) hybrid system, that represents the ideal synthesis of the technology transfer process between the "racing" world and the "road". PERF.E.T. is a combination of two innovations tested at different times by Magneti Marelli on the most important tracks in the world: the electro-actuated gearbox and KERS (Kinetic Energy Recovery System for the F1). Magneti Marelli, indeed, has developed a solution for production cars that connects an electric generator to an automated manual transmission AMT: the electric engine produces torque during the gear shift and at the same time helps reduce fuel consumption. In India, Magneti Marelli has progressively consolidated its presence, which began in 2007, marking continuous and constant growth with a footprint consisting of eleven plants: seven in the northern region (Manesar, Haryana area), working the field of electronic control units, powertrain, intake manifolds, exhaust systems, instrument clusters and body computers, Suspension components & 2W EFI systems ; three in the region of Pune, operating in the field of lighting, intake manifolds and pedals systems, exhausts and shock absorbers and one in Chennai operating in the field of exhaust systems. At present, about 2,300 people are employed by the various plants in India.